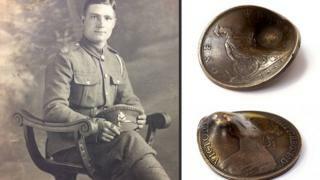 A penny that saved a soldier's life when it deflected an enemy bullet during World War One is to be sold. Pte John Trickett would have been shot in the heart if not for the coin he kept in his breast pocket. Instead, the bullet ricocheted up his nose and out through the back of his ear, leaving him deaf in his left ear. The dented 1889 penny is due to be sold by Hansons Auctioneers as part of a collection of war-related items belonging to the soldier. His granddaughter, Maureen Coulson, from Duffield, Derbyshire, said: "Everyone in our family saw the penny and heard the story of how it saved my grandfather's life. "His two brothers, Horace and Billy, both died in the First World War." The 63-year-old said her grandfather, who was about 19 when he was shot in 1918, was "a great big guy from a Lincolnshire farming background but as soft as a brush". After he was shot, he was discharged and went on to marry Mrs Coulson's grandmother and they had eight children. Mrs Coulson added: "It's strange to think that, but for that penny, his children would not have been born and I wouldn't be here." Adrian Stevenson, a militaria expert from Hansons, said: "It looks to me like a pistol bullet hit the penny at close range. "It left him deaf and disabled but still alive. "I've come across many stories of random objects saving soldiers' lives but I've never seen anything like this before." The coin is due to be sold on 22 March along with items including Pte Trickett's British War Medal and Victory Medal.